To Cite: Farrokh D, Pezeshki-Rad M, Reihani H, Akhavan R, Abbasi B. A Young Woman with Acute Abdominal Pain Following Minor Trauma, Iran Red Crescent Med J. 2017 ; 19(1):e34482. doi: 10.5812/ircmj.34482. Introduction: Renal angiomyolipoma (RAML), is a rare, benign tumor arising from renal mesenchymal cells. Frequently, it is asymptomatic and found incidentally. Spontaneous rupture with consequent retroperitoneal hemorrhage is an uncommon but catastrophic complication of RAML. Case Presentation: Herein, we report a case of a ruptured RAML with a massive retroperitoneal hemorrhage, seen at the emergency department following a minor trauma. A computed tomography (CT) scan showed a left RAML with retroperitoneal hemorrhage. An angiography was performed and then a transarterial embolization. Cessation of bleeding and clinical stabilization occurred without deterioration of renal function. Conclusions: In hemodynamically stable patients with a ruptured RAML, early detection by CT followed by selective arterial embolization may be lifesaving. Renal angiomyolipomas (RAMLs) are rare, benign tumors formed by fat, blood vessels, and smooth muscle. The incidence of RAMLs varies from 0.1 - 0.22%. A RAML is generally asymptomatic and can manifest as abdominal pain, palpable mass, and hematuria (1, 2). The clinical presentation of spontaneous tumor rupture with retroperitoneal hemorrhage and hemorrhagic shock is uncommon (3). The severity of this complication is proportional to the size of the tumor, the extent of its vascular component, and the presence of tuberous sclerosis (4). Angiomyolipomas (AMLs) have a propensity to hemorrhage due to abnormal vascular components and the rich neovascularization (3, 4). Their diagnosis is suggested by ultrasonography and confirmed by CT scan. CT is the diagnostic modality of choice to diagnose RAMLs as the cause of retroperitoneal hemorrhage and to detect the extent of hematoma in the retroperitoneal space (3, 5). Symptomatic RAMLs require treatment, especially in the context of acute hemorrhage. Therapeutic options include embolization and surgery. 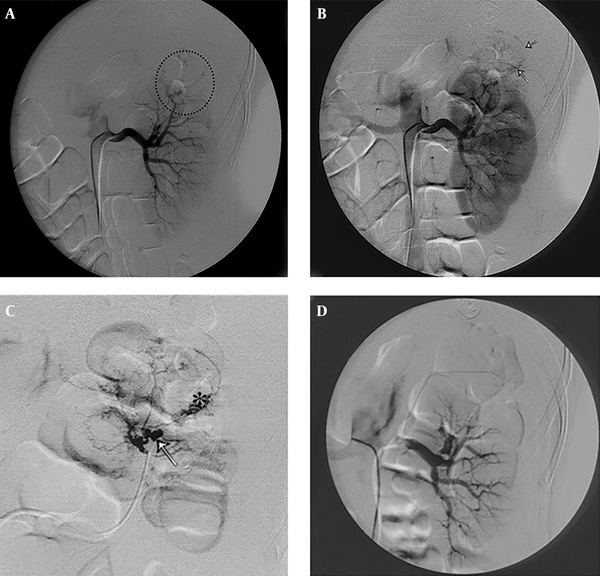 Renal angiography, performed in hemodynamically stable patients, shows the origin of the bleeding and allows transcatheter embolization. The aim of reporting this case is to report a RAML as the cause of a massive retroperitoneal hemorrhage. The authors also discuss the diagnosis and management of a RAML with retroperitoneal hemorrhage. The patient was a 34-year-old woman who presented to the emergency room of Imam Reza hospital, in Mashhad, Iran, which is a level three university hospital, with abdominal pain and nausea/vomiting. Her symptoms had begun two hours before, after a minor abdominal trauma. The pain had been constant and generalized, more severe in the periumbilical area and left lower quadrant, and with no radiation. There was nothing of significance in the patient’s medical history, drug history, or social history. Table 1 summarizes the preliminary examination and laboratory findings. Due to the recent history of trauma, a focused abdominal ultrasound for trauma patient (FAST) was performed, which revealed free fluid in the abdominal cavity. The patient was hydrated, in the following CBC, and after 4 hours, her hemoglobin level had dropped to 7.1. Then, she received two units of packed cells and was sent to the radiology department for an abdominal CT examination. The abdominal CT scan showed a large hematoma in the left perinephric space that had displaced the left kidney anteriorly (Figure 1). A heterogeneous mass in the upper pole of the left kidney contained areas of fat density. No calcification was detected within this mass. A fat-containing renal mass with the absence of calcifications is highly diagnostic for RAML (Figure 2). According to the most probable diagnosis and due to her stability, the patient seemed to be a good candidate for angiographic intervention and so was referred to our endovascular intervention department. After endovascular embolization of the tumor’s feeding artery, the patient remained under observation for five days. She was hemodynamically stable, the hematoma was not expanded in the follow-up ultrasonographic examinations, and the peritoneal free fluid decreased. The patient was discharged and advised to return in three months for follow-up. In this follow-up ultrasonographic examination, the tumor size had decreased and the retroperitoneal hematoma had disappeared. In the upper pole of the left kidney, there is a heterogeneous mass with areas of fat density (arrows). Note that the perinephric hematoma had extended into the peripancreatic space (asterisks). A mass is noted in the upper pole of the kidney (ellipse in A). Although less vascular than the mass in the kidney, it is in fact a vascular mass. Note the tumoral neovascularity in the lesion (arrows in B). C, Selective angiography of the tumor’s feeding artery. Note the aneurysm formations (arrow in C) and tortuous vessels (asterisks). D, Post-embolization renal angiography reveals no tumoral blush. A RAML is a benign tumor consisting of adipose tissue, muscle, and blood vessels (1). It may be either isolated or associated with a TSC (2, 6). Nearly half of the patients with TSCs will have RAMLs, but as TSC is an uncommon disease, only 10% of RAMLs occur in patients with TSCs. RAMLs are uncommon in the general population, with an incidence of between 0.1 - 0.2%. Patients with TSCs and AMLs usually have multiple and larger AMLs that are more likely to be symptomatic and present at a younger age. RAMLs are usually asymptomatic and commonly found incidentally (1, 2, 7). Approximately 64 - 77% of tumors under 40 mm in diameter are asymptomatic, and 82 - 90% of RAMLs 40 mm or larger in diameter produce clinical symptoms. The most common clinical manifestations of RAMLs are abdominal pain, palpable mass, and hematuria. Other symptoms include fever, anemia, nausea, and vomiting. Renal failure and hypotension are rare clinical symptoms (2, 6). Uncommonly, spontaneous rupture causes hemorrhagic shock. The Lienk’s triad, consisting of acute flank pain, a tender lumbar tumefaction, and symptoms of internal bleeding, is caused by intracapsular or retroperitoneal hematoma and is the usual clinical picture of retroperitoneal hemorrhage. A RAML is the most common benign tumor that may be associated with spontaneous intraperitoneal hemorrhage (8, 9). The blood vessels within RAMLs are abnormal, with poor internal elastic lamina. In addition, the smooth muscle is replaced by fibrous tissue. These vessels are rigid, tortuous, and prone to aneurysm formation and spontaneous hemorrhage (3, 4). The risk of spontaneous rupture and retroperitoneal hemorrhage is low in RAMLs of less than 40 mm in diameter and increases in tumor sizes of more than 40 mm (4). In our patient, a lesion of more than 40 mm had ruptured after a minor abdominal trauma. Fat density within a non-calcified renal mass is the most important diagnostic finding of a RAML. When a CT scan demonstrates fat density and calcification within a renal mass, a renal cell carcinoma should be the most important differential diagnosis. CT allows surgeons to plan appropriate therapeutic management (3, 6-8). A RAML rupture is usually limited to the perirenal space, and hemorrhage involving multiple retroperitoneal compartments occurs rarely (19%). However, hemorrhage may spread beyond the peritoneal space and involve the other retroperitoneal fascia and fascial spaces. CT can accurately detect both the primary tumor and the hematoma in various retroperitoneal spaces (3, 8). The treatment for a ruptured RAML depends on the size of the tumor and the severity and extent of the hemorrhage in the retroperitoneal space. If the tumor is small and limited to the pole of the kidney, it may be removed with enucleation, partial nephrectomy, or shock treatment (1, 7). The principle use of angiography for a RAML is for transarterial embolization (TAE) after the diagnosis has been made by other modalities (10). When a RMAL increases in size and becomes symptomatic, or in the case of a ruptured AML with acute hemorrhage, embolization via the renal artery should be considered (11-14). TAE has a major advantage over surgery in that it spares as much functioning renal tissue as possible (11, 14, 15). This is especially important in patients with TSC who have multiple AMLs with much of the renal tissue replaced by AMLs. In our patient, TAE was performed to preserve renal function. TAE is an effective and safe treatment for ruptured RAMLs. However, surgical treatments, including radical nephrectomy and hematoma removal, are the first line treatments in patients with extensive renal involvement and massive hematoma. In addition, a large RAML can be managed with selective arterial embolization to reduce the tumor size or to stop the bleeding in the case of an acute hemorrhage. In these patients, surgeons can then make a comprehensive diagnosis and plan appropriate therapeutic treatment. Authors’ Contribution: All the authors were involved in either managing the patient or preparing the article. Funding/Support: This research was financially supported by a grant provided by the Chancellor for Research of Mashhad University of Medical Science, Mashhad, Iran.